A few days reflection, a more detailed examination of my training logs, and an interesting discussion with Robert regarding nutrition in the comments on my recent post about the Robin Hood half marathon, have provided me with food for thought. I think I have learned some useful lessons, but first of all, I should put that race into perspective. 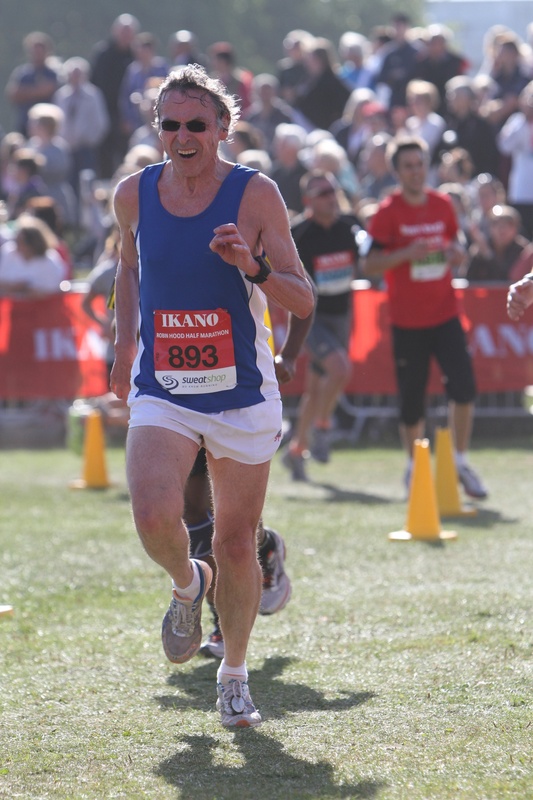 Although I want to race well, and would like to once again run a creditable marathon, the underlying goal of my running is minimising the inexorable deterioration that accompanies aging. 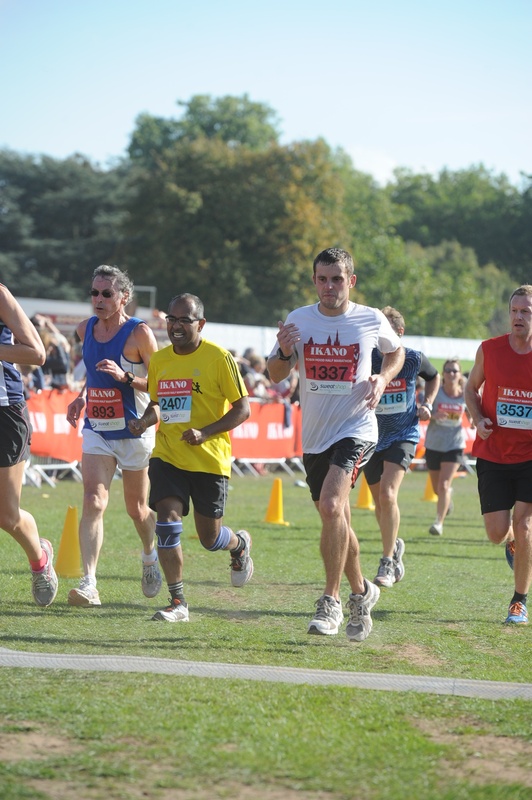 Six years ago, I decided that I would train systematically for a half marathon. I had been running regularly since the previous November, though averaging about only 8 Km (5 miles) per week. At the beginning of March I started systematic training, initially building up volume on the elliptical cross trainer. After 8 weeks my running pace at the second ventilatory threshold had increased from 6 min per Km to 5 min per Km. I added increasing amounts of running and by mid-June, did a 5K time trial in 23:27. I contemplated this ruefully in light of the times of my youth, but decided it was not too bad, and began to speculate whether a half marathon in 105 min might be possible. I continued to do around 35 (equivalent) miles per week, including some elliptical sessions, and occasional longish runs of 15Km. Then in August, the arthritis that had afflicted me in my 50’s made an unwelcome return. At the time, we were on holiday in France, staying in a farm house and sleeping in the loft. For a few days, I was forced to descend the steep steps from the loft each morning, shuffling on my bottom. However, the storm abated as quickly as it had arrived, and about six weeks later, I ran the half marathon in 101:24. That time remains my M60 PB. This year, I have again been able to train regularly, disrupted only by an episode of arthritis early in the year. I have coped with a greater volume – about 46 (equivalent) miles per week over a period of 6 months. However, by August, my pace at second ventilatory threshold was slower than 5 min/Km. I did not attempt a 5Km time trial, but am certain that I would a have struggled to break 25 minutes. A 105 min half marathon appeared to be an absurd goal. However, based on previous experience I was hopeful that a few weeks of higher intensity, lower volume training would produce a major improvement. On the day, this hope was partially justified by the fact that I was comfortably below the second ventilatory threshold while maintaining a pace 4:53 min/Km for the first two Km, on target for a time of 103 min. But my legs were not coping well. As described in my recent post, the pace ebbed away and I finished in 107:49, a little more than 6 minutes slower than my time six years ago. Disappointing, but not really unexpected. WAVA predicts a loss of a little over 1 minute per year for half marathon time at my age, so in fact I have deteriorated at almost the exact rate that WAVA predicts. Furthermore WAVA predictions are based on the performance of elderly runners who are not only naturally fast, but also are deteriorating less rapidly than average as they age. So this year’s evidence indicates that I have at least slowed my rate of deterioration over 6 years to match that of the WAVA standard setters. However, the evidence provided by last years time of 101:50, which is my best WAVA graded performance of my 60’s, suggests that I could do better. This year’s campaign has several other bright spots. I appeared to cope reasonable well with a volume of 46 miles per week for 6 months. This bodes well for my plan to train for a marathon next year. Secondly, I was pleased to find that I can still muster a competitive edge even when nearly exhausted. With one Km to go, the sight of the swishing ponytail of a young lady who had passed me about 16 Km earlier provided the focus. I covered the final Km in 4:56, a little faster than I had managed for any Km between 5 and 20 Km. Having overtaken the young lady with the ponytail with 300m still to run, I subsequently overtook at least four other runners, all younger men, in a spirited run to the line. 150 metres to run and the young lady with the ponytail is now well behind (2nd right). I am in the blue vest and closing on four young men. 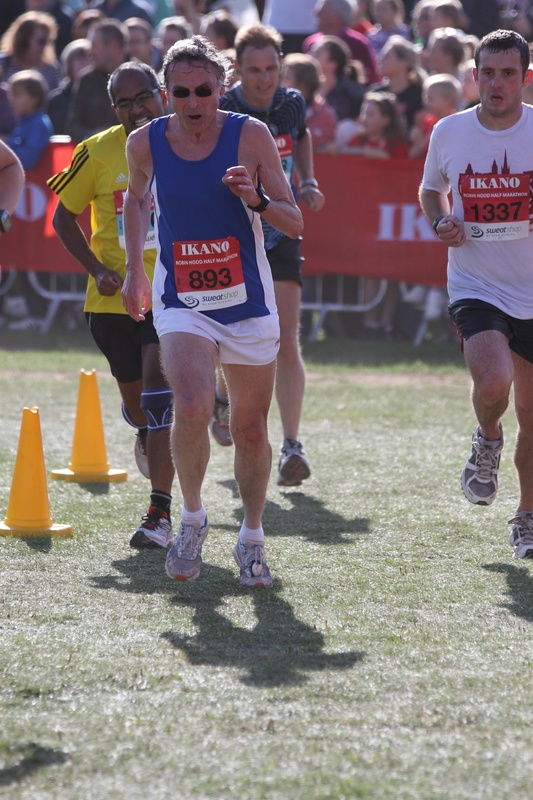 Less than 100 m to go and I am not the only one with an ‘awesome race face’. The competitive juices are flowing. 20 m from the line. The 4 young men are now behind, but I can’t quite catch another young lady, just out of camera view. It appears that I am still able to muster the type 2B (fast-twitch) anaerobic fibres when the chips are down. Unfortunately, type 2B’s can only function at maximum capacity for about 10 seconds. Nonetheless, at least for a brief period, my type 2B’s were twitching fast enough. The foot pod recorded a peak stride rate of 216 steps per minute. But my peak step length was only 118 cm. Thus, the final sprint confirms that the capacity of my leg muscles to generate a strong eccentric contraction is poor. This is clearly one of the major limitations imposed by age. I suspect it is because accumulated fibrous tissue obstructs dynamic stretching of the muscles. During static stretching I can achieve almost as great a range of motion as I could achieve 55 years ago. How can I recover my former dynamic range? As outlined in my previous post, I think hill sprints are probably the best option. But my training log provides further food for thought. My performance was substantailly worse this year than last year despite a 10% increase in training volume in the final six months. It is necessary to look at the type of running, not only the volume. The really striking difference was in the number of long runs. This year I did 32 runs longer than 15 Km in those six months, many of them in the range 18-21 Km, whereas last year I did 16 runs longer than 15 Km in the corresponding period. The increase in long runs was the outcome of a deliberate plan to develop better endurance this year. In fact, I did improve my endurance substantially. Early in April, one month into my half marathon campaign, I maintained a pace of 6:15 /Km and a heart rate of 740 beats/Km during a typical 16 Km run. Five months later, I did a 19 Km run at similar effort level and at a pace of 5:43 /Km, with a heart rate of 697 beats/Km. But is it possible to do too many long runs, even at an easy pace? Dudley’s well known study of rats training on a wheel for various durations and intensities, demonstrated that aerobic capacity increases with increasing duration of running, but only up to a certain limit, that depends on intensity. The duration for optimal gain was greatest at low intensities, at paces where most of the work is done by slow twitch fibres. But even at low intensity, there was no additional gain in aerobic capacity beyond about 90 minutes of training. The physiology of muscle fibres in humans is quite similar to rats, though proportions of fibre types differ both within and between species. Nonetheless, despite probable small differences, it is unlikely in either rats or man, that training beyond around 90 minutes will produce further improvement in aerobic capacity. There might of course be other benefits, including conditioning of connective tissues and improving the balance between consumption of fat and glucose. But could there be penalties? For several years the debate between cross-fit enthusiasts and endurance runners has focussed on the potentially harmful effects of cortisol. In the short term, increase in cortisol mobilizes the body’s resources to deal with stress. In particular, it mobilizes glucose to fuel brain and muscle; and limits inflammation. It should be noted that the brain is the higher priority; although blood glucose levels are increased, cortisol inhibits access to the glut4 transporter molecules in muscle cell membranes that transport glucose into the muscle, thereby ensuring preferential supply to the brain. But perhaps more importantly for the rpesent discussion, sustained increase in cortisol has a range of harmful effects, including destruction of muscle and weakening of immune defences. Cortisol rises steadily during long duration exercise. Typically the level increases to around 220% of normal levels during a marathon. The crucial issue is: how long is this increase sustained? In a fit person, the level returns near to baseline within a few hours. However, in the presence of other stresses, it can remain appreciably elevated for several days. Until recently, the debate between cross-fitters and endurance runners has remained stalemated over the issue of whether or not typical endurance training programs produce a significant sustained increase in cortisol. However in 2012, Skoluda and colleagues published the results of a thought-provoking study. They measured cortisol levels in hair samples in athletes. Levels of cortisol in hair, unlike levels in blood or saliva, provide a good index of sustained levels. They found that in a sample of 304 endurance athletes, fairly representative of committed recreational runners, levels of cortisol, in hair were almost 50 % greater than in a reasonably well matched control group. Furthermore the magnitude of the increase was greater in those with greater weekly training volume. The increase was greater in marathon runners than in half marathoners, though both groups had values that were significantly increased compared with controls. Typically a training volume of 70 Km/week (a little lower than my average of 74 Km/week) was associated with a 1.8 fold increase in sustained level of cortisol. The health consequences of an increase of this magnitude are unclear though such an increase might plausibly result in greater risk of upper respiratory tract infections and even perhaps add to the risk of atherosclerosis and myocardial infarction. There is evidence for increase in atherosclerosis among male multi-marathoners, as I have discussed previously. Furthermore, the elevated cortisol levels might inhibit protein synthesis in muscles and limit any gain in strength. It should be noted that increases in cortisol during exercise are usually less in well trained athletes, suggesting that problems due to cortisol might by ameliorated by a gradual increase in training volume. On the other hand, running in a glycogen depleted state would be expected to increase cortisol levels. Therefore, I remain sceptical of the wisdom of training in a carbohydrate-depleted state. In the discussion following my most recent post, Robert has raised some interesting points related to his positive experiences following changes in both the type and timing of his nutrition, including doing long runs without breakfast. He is running very well at present, though it is perhaps noteworthy that his total training volume has been relatively low this year compared with previous years, and hence, sustained cortisol levels would not be expected. Total volume or length of long runs? Although Skoluda did not attempt to disentangle the effects of total weekly training volume from length or frequency of long runs, the evidence that cortisol rises steadily during a long run raises the possibility that it is the length and frequency of long runs that is the main contributor to sustained elevation of cortisol. When taken together with the evidence that gains in aerobic capacity are likely to be small after 90 minutes of training, I think it is quite plausible that the large number of long runs in my program this year not only contributed to a relatively slow gain in aerobic fitness, but might also have produced a sustained increase in cortisol that impeded the development of strength. Although I intend to prepare for a marathon next year, I will be more judicious in planning the frequency of long runs. You are currently browsing the Canute's Efficient Running Site blog archives for October, 2013.